See also my blog entry, Tru3D: 2 good 2 b 2? My sort of Eureka! moment that got me excited and interested in this was when I went to see “The Polar Express,” Bob Zemeckis’s movie. I saw it in IMAX 3-D and it was spectacular and it changed everything for me. I walked out of that theatre and I just said, movie going for me forever is going to change. What was amazing about that for me, because that’s over three years ago, is that it actually was a 2-D movie post-produced in 3-D. Even though Zemeckis designed it to be seen as 3-D he actually shot it in 2-D and then it was converted to 3-D. I walked out of that, I picked up the phone on a Saturday, called every executive in my studio and said, get down there and see this right away, because this changes everything for us. That’s what started me on this path. It’s why I keep talking about this as a revolution--it's really about digital authoring. Think about what that digital projector does, compared to the two tandem analog projectors. You try to get them perfectly aligned with one another, which is physically impossible to do because film running through sprockets already has jitter in it. So you don't have a high quality experience in the movie theatre until these glasses came along, polarized glasses which are comfortable and simple and it’s not my father’s 3-D. You look goofy, and here’s the thing: I’m looking through red and blue lenses; one eye is red and one eye is blue. How can it not look like crap? Right? It takes whatever is on the screen; it takes color, and it completely makes it--what else can I say? Terrible. So, no more red and blue goofy glasses. Now you have digital projection with absolute perfect synchronicity out of a digital projector, very powerful light coming through so you’re not losing the quality of the image. And as revolutionary as digital projection is to the movie theatre, the new generation of authoring tools are even more impactful and are making a greater contribution. When people were shooting movies in black and white and color came along, it didn’t just change that you shot it with a different film stock. Movies were designed to enhance color. Color is emotion. The fullest dimensionality. And so, suddenly these tools are not about some goofy experience in the movie theatre, but actually provide a higher quality tool for filmmaking. They allow you now to actually create an experience where an audience can be immersed into the storytelling. This has all happened pretty much in the last 18 months. We’ve been working with Intel, we’re created a, for now, proprietary technology called Intru 3-D. These tools are mostly unique to animation but the science of them applies to all kinds of film. For me, it's in the same way that when sound was introduced in a few years--no more silent movies. And then when color came along, after it was introduced, so many movies were made in color, because it was a richer, more engaging, more emotional experience. To me, that’s what 3-D is about. It’s not about the physical dimensionality that we’re creating, it’s about the emotional dimensionality. You don’t even think about 3-D.
A recent 3-D movie like “Bolt,” was partially authored in 3-D but wasn’t conceived in 3-D; they got into it well into the making of the movie. 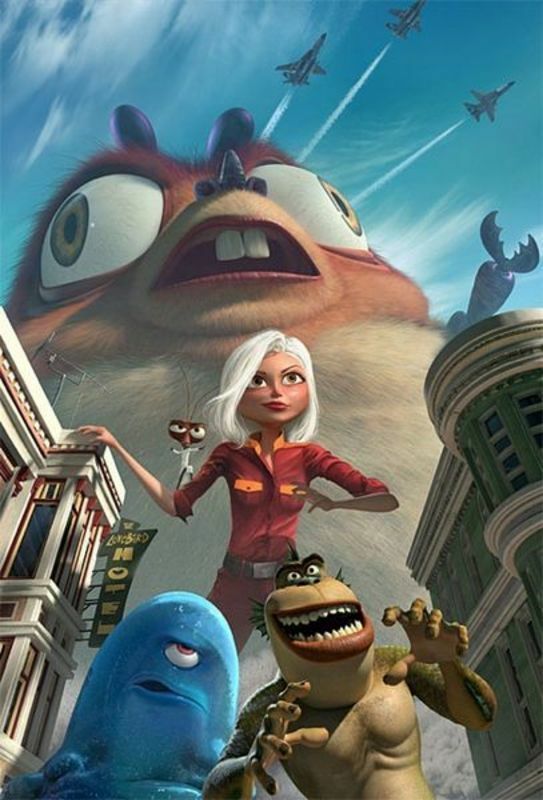 The first film actually authored with this next generation of authoring tools is “Monsters vs. Aliens.” Let me tell you a little bit about the cast first. There's Dr. Cockroach, PhD, with voice by Hugh Laurie. Next we have Bob the Blob, a gelatinous mass that will eat everything and anything, with a voice by Seth Rogen. He kinda steals the show. Insectasouris, is a little grub who in a nuclear thing turned into a 350-foot tall Power of Power, who only speaks in sort of little screeches and stuff; he’s like a baby. And then we have the Missing Link, Will Arnett; this is the ancestor between walking men and our undersea long distance relatives. And then finally, Susan Murphy who is the hero of our story; she becomes the leader of all of these. Interestingly, she is the first female protagonist of a CG animated movie ever. Of all the movies made, Pixar, Disney, Blue Sky, Dreamworks, this is the first time we’ve ever had a female who is the hero of the story, the lead of the story. And Reese Witherspoon has been great. Susan Murphy, on her wedding day, the happiest day of her life, gets hit by a meteor and covered in this kind of space goop and suddenly she shoots up and becomes just under 50-foot tall. In the middle of her wedding ceremony. And they call her Ginormita. And then there's General W. R. Monger. There’s been a secret program the U. S. government has had for 50 years; they’ve been hiding away in a super top-secret, top-security place, the Monsters from all these old monster movies in it and General Monger, it’s been his job to round them up and capture them and keep them hidden away. And he reports directly to the President of the United States, appropriately played by Steven Colbert, right? So this alien guy is on his way to Earth and he doesn’t have very good intentions and he sends ahead of him, this giant robotic probe, this 350 foot robotic probe, to check out earth and retrieve something that he wants and he knows is here. And the thing has landed, crash landed in Modesto, and the President of the United States decides he should go out and actually meet and greet this spaceship. People ask what’s different about this in terms of what we've seen in the past. I think it’s putting aside the fact that there’s no ghosting, there’s no eyestrain, you don’t throw up. Those are all very good things. Any business where you make the customers throw up--not such a good idea. Hopefully once a film gets going, you stop thinking about 3-D. One of the things is that, having worked in 3-D for many years going back to the Disney theme park years, 3-D was always about breaking the proscenium. It was always about holding things out there in front of your face and trying to surprise you. It was a gimmick, it was a trick and it was used as a theme park attraction. I did "Captain Eeo," I did “Honey, I Shrunk the Audience,” I did “Muppet 3-D,” I did “Shrek 4-D.” Now we’re doing the opposite of that. There’s not a single instant, not one single time in which we break the proscenium. Why? The moment you do that, you have…you’ve broken the connection in storytelling because now you’re self-conscious about the fact that you’re watching 3-D and that’s what you’re thinking about as opposed to getting lost in the story. Those lights go down, the screen comes up and , you’re transported to another place and the moment you do an effect in the theatre, you’ve lost that; you’ve broken the narrative. And so what we’re trying to do terms of how we actually use these new tools is to immerse the audience into the experience and to amplify the feelings, the emotions, the dimensionality of what they're experiencing. People will talk about, oh, how great that the Golden Gate Bridge and all those effects look in the movie, but I think more interesting and more informative in terms of where this all goes, is what happens in the War Room. It's a very closed-in place but you suddenly feel like you’re traveling down into this space and that you’re actually there in the room, in the middle of the drama of what’s going on. To me, it’s about amplification of feelings of story, of emotions. Because the one thing I can tell you, as good as this 3-D is, it doesn’t make a bad movie good. It is no substitute for storytelling at all; any more than color was or sound was, . They didn’t change the nature of storytelling. So we're bringing the audience into the movie, as opposed to the movie out into the audience, which is how 3-D has been used in the past. Where we are right now, today, there are 1,500 theatres in North America that can show this film. I expect there’ll be close to 2,500 in four or five months, when the movie comes out. So I’m hoping that about 30% of our admissions will be in 3-D. I expect there to be a $5 premium for the 3-D experience verses the 2-D experience. We spent $150 million making the movie. It cost us $15 million more to actually make it in 3-D. Much more expensive for us in animation than it is in live action. Among the more expensive things we do is rendering, and for a 3-D film we have to actually render the film three times. Right eye, left eye and then a combined version of the film. So it's much more expensive for us. You take a little, small live action movie and it doesn’t cost anything remotely close to that. In terms of the roll-out of theatres, the three largest exhibitors, AMC, Regal and Cinemark, they have a consortium that they’ve put together called DCIP, Digital Cinema Implementation blah, I don’t know what it is. [Digital Cinema Implementation Partners.] And the three companies have come together; they’ve now made a deal with each of the distributors to finance digital rollout. That’s what been holding this up for five years, because digital’s been around for five years. The exhibitors didn’t see anything in it for them so, we couldn’t get aligned on it. Now the exhibitors see 3-D as a way that improves their business and the distributors want it because they eliminate prints; they spend hundreds of millions a year on print. So the distributors have agreed to use that savings to help finance the rollout of this. So by the time the fourth “Shrek” movie comes out in 18 months from now, the summer of 2010, by then I would expect there to be about 7,500 screens and 80% to 85% of our business will be in 3-D.
We talked about the premium charge, the glasses. Oh, here’s a good one. I don’t know whether you lifted your glasses or not while this was exhibited but if you did, you notice that it was completely blurry. And here’s an amazing thing about this. Ninety percent of piracy in movies today is somebody sitting in a theatre with a camcorder. Try to camcorder this it looks terrible. Pirates are stealing billion a year. Go ahead and camcorder this and try and sell it. You couldn’t give it away. There are ways of technically getting around that, but it’s challenging to do and since most of this is done in a very primitive way with people who have no real expertise or science, it will eliminate a huge amount of piracy. Here’s the most unpopular thing I always say but I can’t help myself. I have no self-control whatsoever. People say to me, well, what kind of movies? I mean, it seems great for animated movies and maybe big action... But I think--all movies. Because I always come back to the introduction of color. Color is how we see, so when color came along it was a richer experience and soon almost all movies were made in color. It's more aligned to how we see. We take in more information in 3-D, and so honestly, I don’t know how many years it is, whether it’s five years or ten years, but I actually believe a day will come when what you see in a movie theatre is a 3-D film. “The Queen” in 3-D. When is home viewing gonna come in 3-D? Well, technically, it's doable today. It’s not a big deal. But it’s gonna be a very long time before it’s widely deployed out in the home. When I mean a long time, I mean 10 years or more. The home experience has gone through this extraordinary innovation in the last 10 years. Big flat screen TVs and high def and blue-ray and digital sound and it competes with them. Let’s be clear. What you can do in your home today, what many people can do in their home, actually competes with the theatre experience, not with 3-D. 3-D puts the theatre back again as the premiere place, as the experience that you can’t have in your home. You can do it in your home but you don’t get peripheral vision which is so important, and you don’t get black, which is incredibly important because any light source quickly dissipates 3-D. But if you think about in your home, you don’t sit in a black room, all the lights blocked out, black-out drapes and stuff like that. I think it will be a very long time before the home experience does this. The analogy I make is like with sports. Maybe 75,000 people went to see a football game over here yesterday and it’s a fantastic experience and it’s unique to see sports live. But many millions of people watched it on television. Different, but a great experience. And that’s what's going to happen with movies. You come to a movie theatre, it’s for a premium experience. It’s still great. People take “Kung Fu Panda” home and they love it, and it’s a great value and it’s a great movie and they’re happy to be able to play it over and over again in their home, but it doesn’t diminish the home experience, it elevates the theatre experience. People ask me, will there be a time with no glasses? Well, first of all, on the glasses front, which is fun, is I went to this company, Luxotica, which is the largest eyeglass manufacturer in the world. I said, this revolution is coming and to me it’s a fantastic opportunity for the eyeglass business and so I challenged them to come up with great 3-D eyeglasses, and they are so close, probably by the middle or end of next year, they will have eyeglasses that when you’re outside are your sunglasses and when you come into the movie theatre they transition to your movie glasses. So in a couple of years when people realize that they’re going to movies five, seven, ten times a year, watching 3-D, they actually will have their own glasses. Just like you have a tennis racket or a golf club or running shoes, or sunscreen if you’re gonna go to the beach. You go to the movies, you bring your movie glasses. That means prescription 3-D. Everybody will have their own glasses, whether it’s prescription 3-D or just cool 3-D because, there’s a stigma about people have about wearing glasses. The ones we're using now are pretty cool, they look like regular RayBan glasses. When people would put those old red and blue ones I put on, they look goofier than hell--which is why you took my picture so you can blackmail me. I asked about the prospects of serious movies in 3-D.
James Cameron’s doing a live action one and we’ll see, because his movie, “Avatar,” is gonna be dramatic. It’s a big Jim Cameron movie but it’s a dramatic movie, it’s not a comedy. And I have to say I have a lot of confidence about it, I really do, because--it becomes subtle but again, it feels to me like whatever the sentiment is, whether it's anxiety or it’s insecurity or whatever those things are, when you can see all the dimension of the character and the dynamic in a room, the things just feel stronger. There hasn’t been a drama made using this next generation 3-D. So I’m projecting what I believe it will be, but I don’t know. Brightness is important. Do you find the reports true that some theatres turn down their bulbs to allegedly save money? How that will that affect showing 3-D? Not digital. Two things have happened with this next generation of projectors and screens. One is, they’re showing a more intense light out of the digital projector. The second thing is, this is a new generation of silver screens which actually reflects light better. We do make some adjustments. Yesterday I had previews in which we were doing a 2-D version and a 3-D version in two different theatres at the same time and we didn’t have time to do the adjustments, and I noticed that the 3-D version of the movie hadn’t been color-timed just right yet so it was actually a little duller than it should have been. But that’s a color-timing thing that you can do in post-production. And a regular movie will benefit, because this screen has got much more reflectivity to it. A regular movie would actually play well because of both the amount of light that these new projectors throw and how much is reflected from the screen, from the silver screen. What I've noticed ever since the days of “The Lion King” and “Shrek,” is that you seem more hands-on in the day-to-day making of a film than probably any other executive up there at your level. You roll up your sleeves. I love this, but to be honest with you, I’m not. I actually have to say that the students have become the teachers and that when we first started Dreamworks everybody was at their job new and they were first-time directors, first-time editors and animations; everybody was new and so honestly, the analogy I would make is to a football game. I used to be the quarterback. I would have the ball on every play as the quarterback does. That stopped probably about five years ago and I moved to the sidelines to become the coach and probably about two years or so ago I moved up to the owner’s box. And what I’m most effective at is setting the goal line and then carrot, stick, club, love, whatever it takes to get them to the goal line. This movie is very much reflective of Conrad Vernon who directed the second “Shrek” movie, and Rob Letterman who directed “Shark Tale” for us; the two of them got together, they love those old ‘50’s and ‘60’s monster movies. You see so many homages and stuff that are in it. Every scene you can see just bits and pieces of “Dr. Strangelove,” and everywhere you look here there’s these little bon bons that are being thrown out there but that’s them, that’s the filmmakers in this. We had these previews yesterday and they’re like three yards left to get to the goal line to get the movie from good to great. That’s when I step in, , so that’s when I push down and say, you can’t settle, you gotta give the extra last mile. Because they’re exhausted; they’ve been working for four years, they’re ready just to be finished. I won’t let them. Not until it’s the best. Katzenberg's three holy grails of 3-D, and how the new technology changes them . 1. You need a very dark environment because you don’t have the same depth of field. So it's difficult to show dark things. But here our War Room is dark, and it looks great. 2. No very fast things; the fast things moving across the screen, you get the streakiness of keeping the right eye, left eye film aligned. But in our process you see things like jet planes and helicopters, and her racing by you on her skates. You don’t get any of that latency, you don’t get any of that streaking or motion blurring. 3. When you have very fast cutting, that’s what gives you eyestrain. And now, because literally we can control how little or how much dimension is in every frame of the film, when we are doing fast cuts we lessen the 3-D so that you don’t get eyestrain on it. I was amazed when thy were demonstrating digital projection at Cannes and claiming how good it was. But now it has grown so much better. When it first came out, it was very cold and it didn’t have texture to it and now because of how many more pixels, how much more control, how a cinematographer can actually get the thing you want....I mean, digital was white light and cold and film had a very unique kind of warmth to it. Now, from the better quality and the evolution, the power of it has gotten to the point where even Steven Spielberg uses it. He objected to digital projection for a long time. It was too cold for him. “Indiana Jones” went out with, I don’t remember, 100 digital prints, because it’s now at the point where he likes it. Lucas was into it very early on and they used to sort of debate one another where Steven would say, “I don’t like how my film looks if it’s not in film.” And now today, he’s kinda passed to the point where he feels satisfied. But the thing is, it’s the story, story, story, story. One, two, three, four, five, story. Then, six, 3-D. With all the things we have, all the tools, and all the money we’ve invested, the one thing, sort of depressing but it's true, is that 3-D will not make a bad movie good. I only wish. But it won’t.